Polaris has supported Southport engineering client Lattimer through a rigorous vetting process to be crowned winner of the Queen’s Award for Enterprise. The precision-machinist has been officially recognised as a world-class exporter after being presented with the 2018 Queen’s Award for Enterprise – International Trade. Queen’s representative and Lord-Lieutenant of Merseyside Mark Blundell visited the £12million turnover company to present the award to the firm’s senior management, employees and apprentices. It follows a Royal Reception held at Buckingham Palace, hosted by The Prince of Wales, attended by Lattimer Holdings CEO Stephen Waterhouse and Managing Director Mark Hailwood. Lattimer manufactures around 30,000 different products for container glass manufacturing plants in more than 60 countries worldwide. It is now permitted to fly The Queen’s Award flag outside its head office for a period of five years. Polaris co-founder Sam Pinnington said the Queen’s Award application process included a detailed 10,000-word submission. 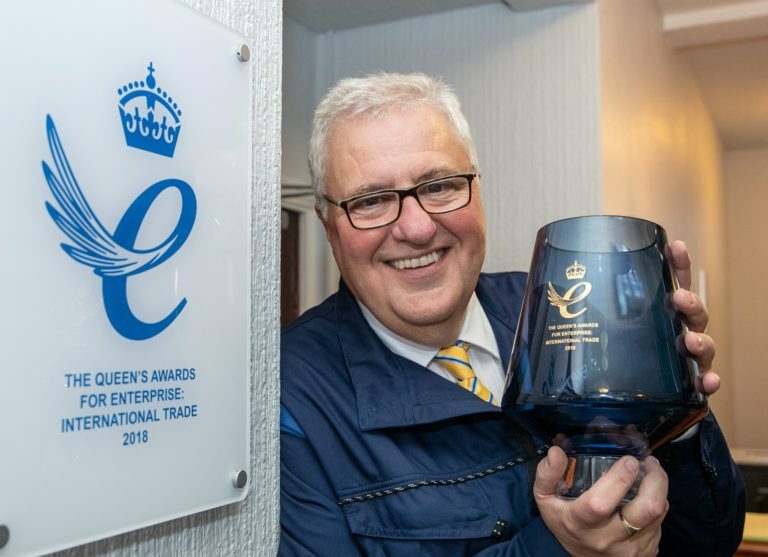 “The Queen’s Awards are ranked amongst the highest for British businesses and presented by Her Majesty the Queen, on the advice of the Prime Minister,” he said. “It marks a significant moment in Lattimer’s 76-year history and is the culmination of decades of hard work from a number of generations. “Polaris was able to combine journalist skill with knowledge of private business to produce a compelling written submission. Our team spent a number of days interviewing senior management to capture the unique personality of the business while securing exhaustive facts and figures required to demonstrate growth over a period of three years. “Over the years we have developed a strong track record in award submissions for many clients. Other recent big wins include writing applications for our client Cammell Laird to win Business of the Year titles at both the Liverpool Echo and Insider’s ‘Made In the North West’ awards in 2018. The Queen’s Awards for Enterprise is an awards programme for British businesses and other organisations which excel at international trade, innovation or sustainable development. The scheme was established as The Queen’s Award to Industry by a royal warrant on November 30, 1965.